If you have celiac disease or an allergy to products that contain gluten, it does not have to stop you from enjoying bread products. Instead, try these recipes for bread that do not include gluten products. Preheat oven to 350 degrees. 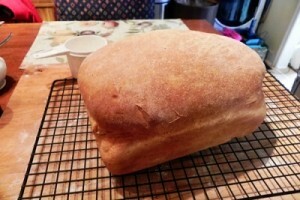 Lightly spray or grease a 9 x 5 bread pan. In a large bowl combine the flour, cornstarch, tapioca flour, xanthum gum, baking soda, cream of tartar, and salt. Mix together with a wire whisk. In another bowl combine the soft butter and the brown sugar, slowly add the egg substitute and beat till fluffy. Then add in the vanilla and mashed banana. Mix well. Add in the flour mixture till smooth. Pour into the prepared bread pan and bake for 50 – 55 minutes. Allow to cool in the pan for 10 minutes before removing and cool on a wire rack. In a bowl whisk together the egg and the water together. Add to the breadmaker. Pour in the melted butter, lemon juice and the liquid honey. In a bowl combine the flours, xanthum gum, powdered gelatine, salt, sugar and the powdered milk. Add to the breadmaker. Sprinkle the yeast on top. Set bread machine to basic and 2 lb. After the bread is cooked, allow to cool in the breadmaker for 10 minutes before removing. Cool on a wire rack and brush the top of the loaf with melted butter. Being on a gluten free diet does not have to mean that you cannot enjoy products such as bread. A recipe for banana bread and white bread are listed above. However, there are many more different gluten-free recipes for delicious bread. Do a search online to find many more great recipes and enjoy!